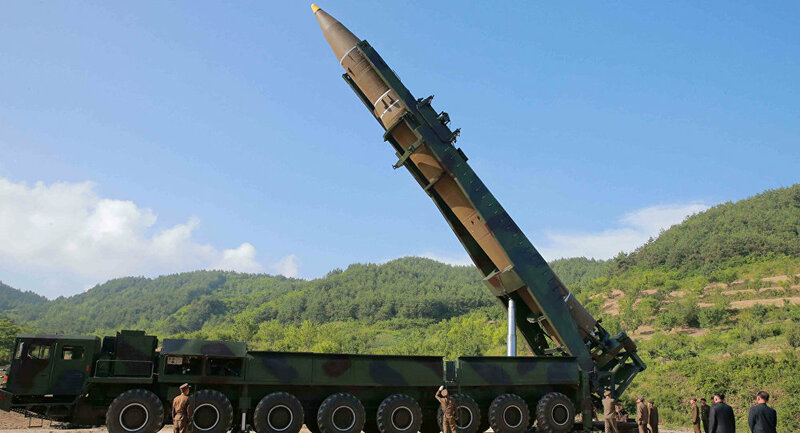 The South Korean Defense Ministry said Wednesday that it is not sure whether Pyongyang has in fact achieved success in the development of the intercontinental ballistic missiles (ICBM) as there is no proof that North Korea's missile returned to the atmosphere after the latest launch. MOSCOW (Sputnik) — North Korea announced on Tuesday that it had successfully launched its first intercontinental ballistic missile, the Hwasong-14, at 00:30 GMT. It said the missile traveled 580 miles and reached an altitude of 1,740 miles during its 39-minute flight before "accurately hitting the target waters" in the Sea of Japan. "Considering that the missile was launched from a fixed launch pad, and that we have yet to confirm whether [the missile] has re-entered [the atmosphere], there are still limits for us to conclude that the North has been successful in its ICBM development," the ministry said, as quoted by the Yonhap news agency. The ministry also pointed out that North Korea used the fixed land-based launch pad for the latest missile in order to avoid damage to its road-mobile pads as the launch appears to be of a research or development phase, according to the agency. The Russian Defense Ministry said on Tuesday that North Korea's missile only reached a maximum altitude of 332 miles and flew only 316 miles. According to the ministry, "the parametric data of the ballistic target’s flight correspond to tactical and technical characteristics of a medium-range ballistic missile."